JUAN Martin Del Potro saved two match points en route to victory over Roger Federer at Indian Wells on Monday morning, ending the Swiss's perfect record in 2018. The Argentine wasted a match point of his own in the second set and appeared on the verge of defeat when Federer served for the match at 5-4 and 40-15 in the third. But Del Potro stormed back to force another tie-break, which he breezed through 7-2 to claim a memorable 6-4 6-7 (10-8) 7-6 (7-2) triumph. The 29-year-old Del Potro, who won the 2009 US Open but has been hampered during by injuries during his career, said at his on-court trophy presentation: "I'm still shaking. I cannot believe I'm here with this trophy, beating Roger after a great battle. "I was really angry after the second set but I was lucky in the last tie-break I played well and finally I got the trophy." Del Potro was keen to praise world No.1 Federer after the match. The defending champion was looking to win his sixth Indian Wells crown and his third title of 2018, but the 36-year-old could not build on his second-set success to claim victory. 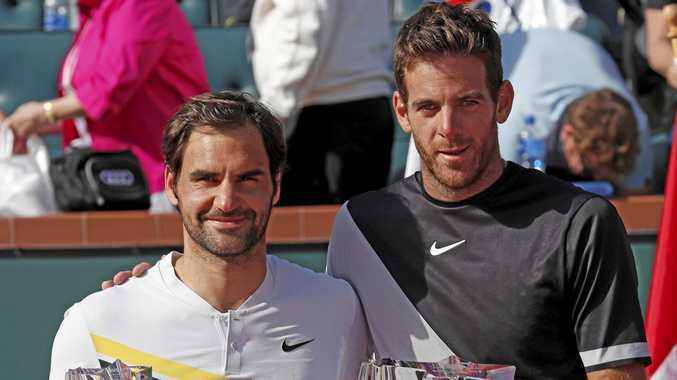 "I want to congratulate Roger, for a great week, for great success in this historical year," del Potro said. "You are making history and I'm so happy to be behind you, seeing what you do and it's amazing for our sport and for life." Del Potro's success at Indian Wells comes nine years after his US Open title win over Federer and he intends to relish the moment before looking to his next goal. "I just want to enjoy this moment, it's so big for me," del Potro said. "I've never won a title like this and I think it's time to celebrate for a little bit and then think about Miami, which is one of my favourite tournaments on tour," he told Sky News. "I will try to play as good as I did here, but then it's time for a break so my body can recover and then see what tournaments on clay I will play." Federer, who had won 18 of his previous 24 previous ATP meetings with Del Potro, said: "I'm so happy to be back in the final here in Indian Wells. I had a great run and a great week on and off the court." To Del Potro, he added: "Well done, you deserve it, you were the better player in the end. There was not much between us but you deserve it, well done and enjoy the moment."